I can't believe it! Have I really been this lazy? I finally got the July Autoship Clubs posted so you can see all the pictures! You will have to check it out on our site! 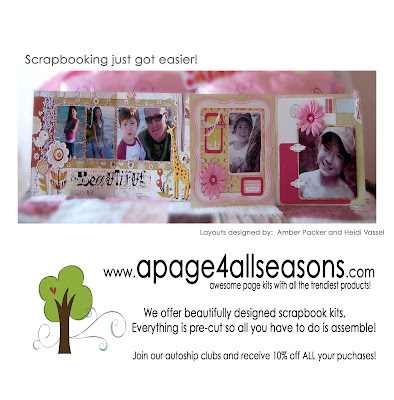 We are putting an ad in Scrapbook Trends Magazine! Our first ad will run in August. I have to admit, I tried to the ad myself (and on a TIGHT timeline), so it is pretty amateur. It was fun to figure out though! I think I will be able to make the next one so much better! I will give you a "sneak peak"! Oh - check it out! We are changing ALL shipping to be $4.99, and if you order over $75 in product, your shipping is FREE! I hope you are all doing well. Summer is here so it is time to play! Yeah!